Disclaimer: Using a table saw in this manner is inherently dangerous. No one should attempt these cuts without proper jigs and the experience to use them. 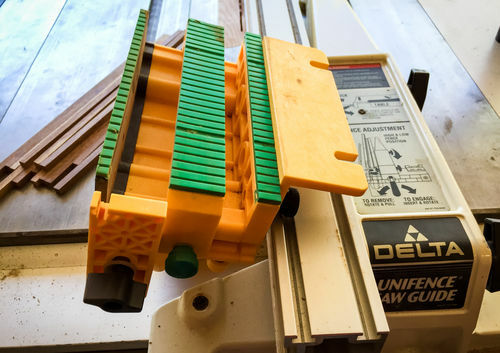 There’s been some discussion lately regarding cutting thin strips on the table saw. Naturally everyone has their own way that they’re comfortable with and provides the level of accuracy they need for the task at hand. Basically there are several methods, the three most common being fence side, off fence side and a sled. I’m going to discuss my method for cutting precise thin strips on the fence side of the blade. This is probably the most challenging of the three methods, but I’ve found it to give the most accurate and consistent results. I have a regular need to cut square strips that are 0.270 ± 0.008 inches by 12 inches long. Crazy sounding, I know, but the numbers are critical. Here is my technique for setting up the fence and making the cuts. The first challenge is getting the fence set that precisely in the first place. To accomplish this, I start with a spacer board I keep for the purpose and set the fence so that it just fits between the fence and blade. I make a test cut and measure the resulting strip with calipers. I then use a technique I picked up from William Ng of using feeler gauges to do the final adjustment. As shown below, using a feeler gauge between a stop and the fence allows very exact adjustments. In the setup I just did, the test strip was 0.286 inches wide. To adjust for this, I set a 0.008” feeler gauge against the fence and set the stop firmly against it. Then, by removing the feeler gauge and nudging the fence to touch the stop block, I get the cut width to about as close to 0.278” as is possible in this situation. 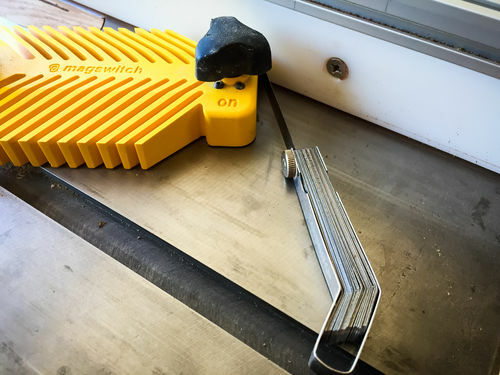 (If the test cut had been thinner than required, the technique is to place the stop block against the fence, and then move the fence back, insert the feeler gauge and then move the fence to touch it, thereby increasing the cut width by the thickness of the feeler gauge). Important Note: Why set the fence to 0.278” when my target width is 0.270”? The reason is that it is physically impossible for the piece to drift into the fence since the fence is a solid surface. The cutting error occurs when the strip being cut drifts away from the fence, and when you’re talking a few thousandths tolerance, it doesn’t take much drift to exceed that. By setting the fence to 0.278”, it ensures that’s the widest the strip can be cut, and it allows me a full 0.016” of leeway drifting away from the fence and still be within spec. Getting the fence set properly is only half the battle however. The biggest challenge in making thin cuts like this is controlling the piece during the cut. After trying a few different methods, I settled on the GRR-Ripper from MicroJig. Set up as shown below, its 1/4” pad controls the strip being cut nicely. The rear sacrificial heel kit for the GRR-Ripper ensures that the piece is pushed through the cut and no slippage can occur. Even with this, it’s a good idea to wipe down the pad regularly with DNA to keep it tacky to hold the strip tight against the fence. 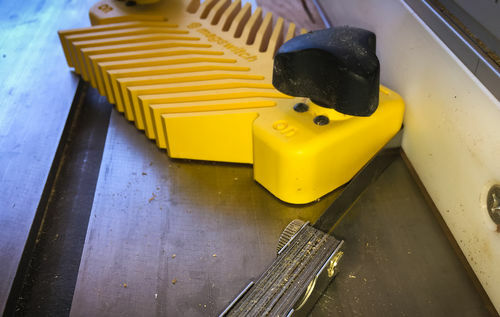 It’s also important to follow the standard safety practice of being sure to push the piece past the blade, so there is no risk of it kicking back when you lift the GRR-Ripper. 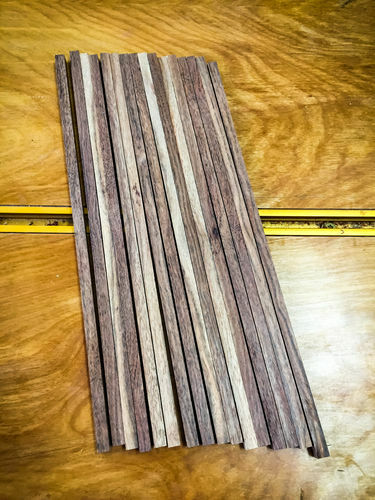 Here are the strips of chechen I was able to cut in just a few minutes, and the measurement. I still have to go through them for QA and toss any that are out of spec, but with careful and deliberate cutting at the saw, the yield is almost always 100%. I’m glad you mentioned the GRR-Ripper. There are not many ways to control thin strips as they pass between the blade and fence. With the accuracy and consistency you are after, the ability to keep the wood tight to the fence is key. When I need to micro-adjust the fence, I use a dial gauge mounted on a magnetic base. Place the base on the saw surface with the plunger touching the fence, zero it out, then nudge the fence the required number of thousandths. Good tip. Thanks for adding that. Well thats got to be serious stuff if the feeler gauges are out! 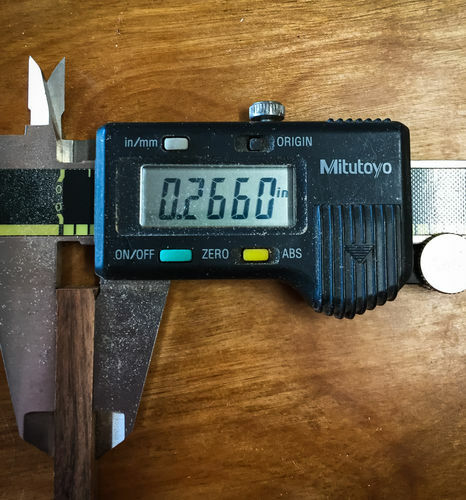 So just what are you doing with these micro precise pieces of wood that are 0.270 ± 0.008 inches by 12 inches long? Nice process, nice tools, and results. BTW what does the ABS function do on your vernier calipers? Almost exactly how I do it Rich except I never used feeler gauges even though I have a set in the shop. I’m always end up just tapping the fence with a piece of wood. They become premium quality chopsticks. I use exotic hardwoods and painstakingly hand craft them. The blanks are just the first step, I hand scrape them, cut them to length, and taper them in a custom made jig on the router table. This is followed by several more proprietary steps that produce the finest chopsticks you can buy. Here in Tucson, mesquite is my top seller. Local resort gift shops carry them and they are very popular with tourists who want to take a little of the desert home with them. Oddly enough, my two biggest moneymakers are residential doors and chopsticks. Pretty much on opposite ends of the size spectrum. The ABS button is a funny one. It switches them into INCremental mode. Makes total sense huh? The really dumb thing is that pressing it again doesn’t switch them back. You either have to press and hold it for about 3 seconds, or turn them off and back on. Luckily it’s something I never use. WOW. I’ve not needed this level of accuracy, but i am really interested in learning about your techniques and tools. Thanks! Almost exactly how I do it Rich except I never used feeler gauges even though I have a set in the shop. I m always end up just tapping the fence with a piece of wood. 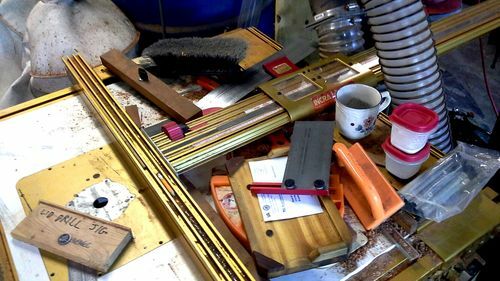 Actually, William Ng sets the table saw fence by eye in his “5 Cuts to a ‘Perfect’ Cross-Cut Sled” video and uses the feeler gauges for the sled fence adjustment. I’m no William Ng, so I use the feeler gauge crutch on the saw fence as well. I think you need to march straight over to the “Cheating vs. Training Wheels vs. Efficiency” thread and confess your sins. I cheat whenever possible. There are process guys and end product guys, and I’m definitely an end product guy. I cheat whenever possible. There are process guys and end product guys, and I m definitely an end product guy. +1 on that, good buddy. Well said. I just set my Incra fence and twiddle the .001 dial. Fast and accurate (.002”) every time. 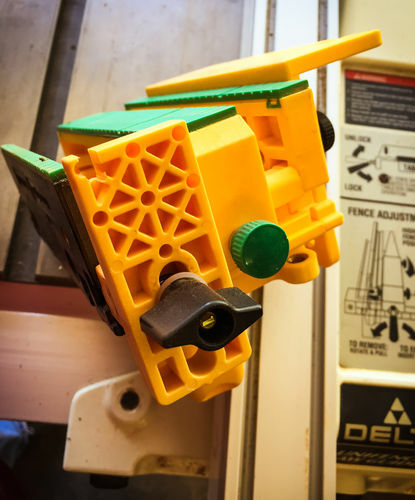 Is your router in the middle of your tablesaw? Or does that router fence have an unusually long arm? I am still looking for your Incra fence you mention !! is there a routerin there some where too!